Sync - the customers' profiles and the generated invoices are synced with Xero. During the integration setup, you can choose whether to sync invoices automatically or manually. Export Invoice Document - you can configure OfficeR&D not to generate the invoice documents so that Xero can create them for you. Pull Charges - you can configure OfficeR&D to automatically pull reconciled payments from Xero and mark the invoices as paid on the OfficeR&D side. To set up you OfficeR&D and Xero integration you first need to have both OfficeR&D and Xero accounts. IMPORTANT: In order to connect OfficeR&D to a Xero account, the Xero user that connects the integration has to have at least Standard user permissions for the Xero organization. Read more about Xero user permissions. Locate the Xero under Accounting section and click Activate. Click connect and authorize OfficeR&D to use your Xero account. You can choose to select one common Xero account for all locations or configure different Xero accounts - one for each location you created in OfficeR&D. Click Add and select the OfficeR&D location that you want to map to the Xero account. You can connect each location created in OfficeR&D to a specific Xero account. This way you can map the same OfficeR&D billing accounts to different Xero revenue accounts purely based on the location of the customers being invoiced. By default, the system will connect the Xero integration with all OfficeR&D locations. Click Configure to define the mappings between OfficeR&D and Xero. TIP: When you connect OfficeR&D to a Xero instance that is invoicing other products or services outside of what OfficeR&D invoices, we recommend that you use the Xero numbering to avoid the two systems duplicating invoice numbers. In that case, navigate to Settings/Invoicing and deselect the Generate invoice numbers in OfficeR&D option. The configuration is like an interpreter between the OfficeR&D language and the Xero language. The "conversation" between the two systems revolves around invoices and is driven entirely by OfficeR&D. Depending on how you set up the integration, OfficeR&D will let Xero know when a new invoice is generated and updated. OfficeR&D can also regularly ask Xero for updated payments on invoices. You control whether these "conversations" are automated or manually triggered. Each "conversation" contains information about the invoices and their line items, which is why you need to configure mappings between the attributes of the invoice line items in OfficeR&D and Xero - tax rates, plans, payment accounts. Default Status - configure the default status of the invoices created by OfficeR&D in Xero. This status is applied when an invoice is first created after a sync operation between OfficeR&D and Xero. Pull charges automatically - tell the system if you want it to automatically pull charges from Xero. 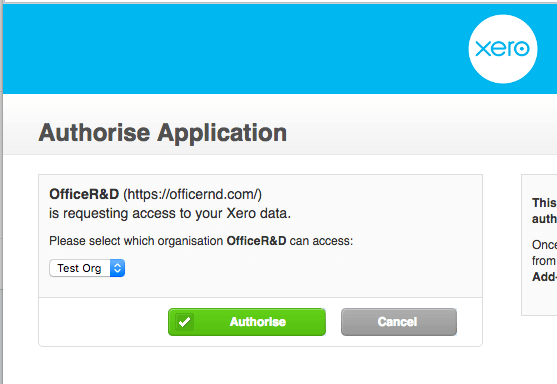 When that option is enabled, invoices reconciled in Xero will be automatically marked as Paid on the OfficeR&D side. Reference template - If you will generate the invoice documents in Xero, you can set a template to be used to populate the invoice Reference property in Xero. You can use the following OfficeR&D placeholders in this template: documentNumber, documentReference, customerName, customerEmail. The Revenue Accounts tab is the most important tab of the integration. Within it you "translate" the accounts configured in OfficeR&D under Billing/Accounts to accounts you created in Xero. These mappings define how OfficeR&D allocates each invoice line item to an account in Xero. On the left side of the tab, you find a list of all Accounts configured in OfficeR&D. Each one needs to be mapped to an account in Xero. To change the OfficeR&D accounts, navigate to Billing/Accounts. The Payment Accounts tab enables you to map every payment option available in OfficeR&D to a payment account in Xero. On the left-hand side, it lists all payment option is OfficeR&D, starting with the manual payment options and listing any options provided by an integrated payment provider. Cash - map to a Xero payment account to record cash payments manually entered on invoices in OfficeR&D. Bank Transfer- map to a Xero payment account to record bank transfer payments manually entered on invoices in OfficeR&D. POS - map to a Xero payment account to record POS payments manually entered on invoices in OfficeR&D. Cheque - map to a Xero payment account to record cheque payments manually entered on invoices in OfficeR&D. [Payment provider] Card - this option is only available if you integrated OfficeR&D with a credit card payment provider. Map to a Xero payment account to record credit card payments charged via OfficeR&D. [Payment provider] [Payment Method]- this option is only available if you integrated OfficeR&D with a payment provider that officers non-credit card transactions such as ACH. Map to a Xero payment account to record the payments charged via OfficeR&D. The Tax Rates tab enables you to map every tax rate you configured in OfficeR&D under Billing/Tax Rates to a tax rate in Xero. Make sure to map every tax rate, including the 0 tax rate options as otherwise, the integration will yield errors. The Tracking tab allows you to track invoice line items in Xero based on the location of the invoice in Xero. Track location by - select whether you want to use Classes or Locations in Xero to tag the invoices. [Location Name] - map every OfficeR&D location to a class or location property in Xero so that OfficeR&D knows how to translate the invoice location to Xero. Based on that setting, you will be able to track the revenue streams per location. The Inventory tab enables you to map the OfficeR&D Billing/Plans to inventory items you create in Xero. These mappings need to be configured only if you haven't configured Revenue mapping and your accounting works based on inventory rather than accounts. TIP: If you map an OfficeR&D account to a Xero account in the Revenue Account tab, it will take precedence over the inventory items mappings. On the left side of the tab, you find a list of all Billing Plans configured in OfficeR&D. Each one can be mapped to an inventory item in Xero.